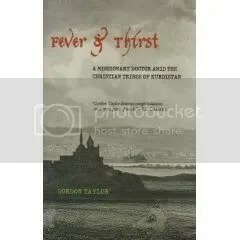 The most impressive feature of Fever & Thirst, Gordon Taylor’s meticulously researched study of the misadventures of a 19th Century doctor and missionary in the remnants of the Ottoman empire, is the grudging sympathy we come to feel for Asahel Grant, the erstwhile hero of this tale. By current standards of tastes, he is not an entirely endearing character: stoic, overly pious, headstrong and something of a quack. There is little to recommend him. Indeed, the opening chapter seems contrived to lower our expectations. This upright Victorian appears to be something of a masochist or a fool. Rousing from a hard night out of doors in Chumba, very close to what is now the border between Turkey and Iraq, our man finds his face swollen “into a bubble of pain.” The night before he had slept on an azraleh: a platform rising some ten to fifteen feet above the ground to avoid mosquitoes. The particular azraleh that Grant slept on rose only a few feet above a roaring cataract whose cold waters he presumes have caused the swelling. Near the end of the first chapter, entitled “Remedy” we are introduced to what Grant-an M.D. by the standards of the 19th century-determines is the appropriate cure: a lancet, thrust fiercely into his jaw again and again to drain off the swelling. Indeed, Gordon Taylor devotes page after page to the leech gatherers of that time and the paradoxically effective powers of violent emetics. In retrospect what is most curious about this passage is how pronounced that word `illusion’ stands out. Calling to mind Freud’s Future of an Illusion and the indictment of superstitious belief patterns in general. And yet, it’s a credit to Taylor’s art, perhaps, or at minimum, his sympathy, that Asahel Grant’s world stands on its own: horrific, primeval and heroic, even for modern day readers far removed from both Grant’s cures and his beliefs. In addition, I found myself reading this book in awe of its encyclopedic knowledge of the medical and religious practices of that geographic area and era. The main thrust of the story, however, is simple disaster. At twenty five years old, Grant’s wife, Judith Campell Grant, dies in the relative wilderness of Urmia among the Nestorians, a group of primitive and semi-heretical Christians that Grant has come to cure and convert. She had “toiled like some super human being. She bore a son in the summer of 1836 and twin daughters in 1838. She taught school, she learned Persian, Turkish, and ancient and modern Syriac, she nursed the sick.” Of course, soon she fell ill herself. Taylor notes that it was probably Malaria. He ends by eventually abandoning his children to conduct his missionary / medical work. The work itself Asahel Grant has no doubt about, but a modern reader lingers over certain questions of efficacy and judgment. Why abandon your own children? Are cures of leech bleedings and vomit inducing emetics the best possible thing to bring to these mountain primitives? And, as if that weren’t enough, must you introduce your own prejudices to them: railing against the Papists (“sons of perdition”) and Anglicans alike, while trying to dodge the advances of the latest band of Kurdish thieves? The end comes quickly, ironically, within days of the notice that he must return home. He dies, imagining he is on a ship, traveling to his home. On April 24, 1844, by the banks of the Tigris, in the city of Mosul, which is even now the scene of horrific battles, Asahel Grant was buried. Even the Turkish governor at the time attended. The other Christian missionaries-his comrades– lingered on for a time, as was their pattern, but soon even they departed, driven like Asahel Grant, and like our own violent effort today, by their own loss of illusions. This entry was posted on Saturday, October 6th, 2007 at 10:24 pm and is filed under Uncategorized. You can follow any responses to this entry through the RSS 2.0 feed. Responses are currently closed, but you can trackback from your own site.